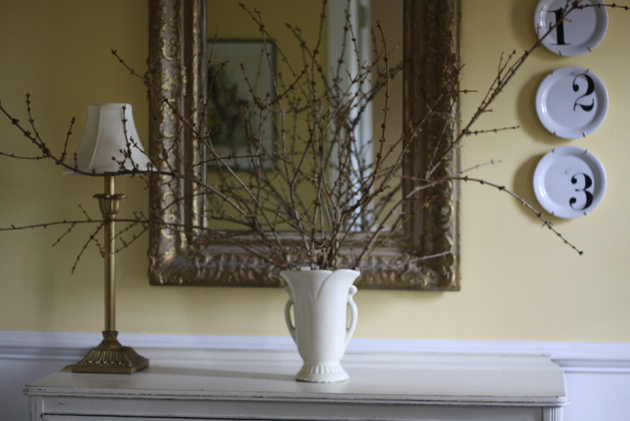 Did you know that you can force forsythia inside your home and enjoy glorious blooms indoors while it’s still cold outdoors! So you know what I do this time of year when I’m itching for Spring? 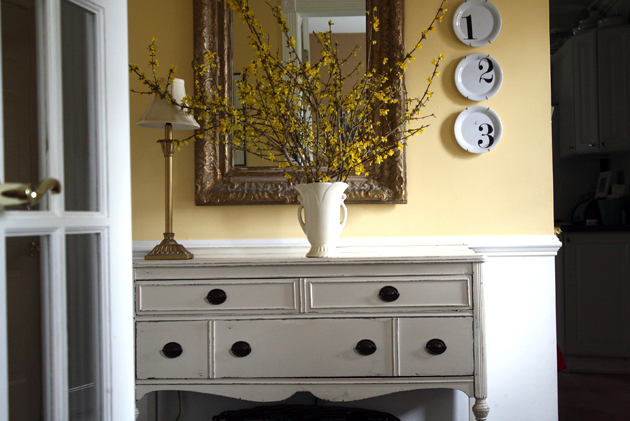 I force forsythia in my foyer. You should try it. It’s brilliantly simple and splendidly soul satisfying. First you’ll need to find a forsythia bush. 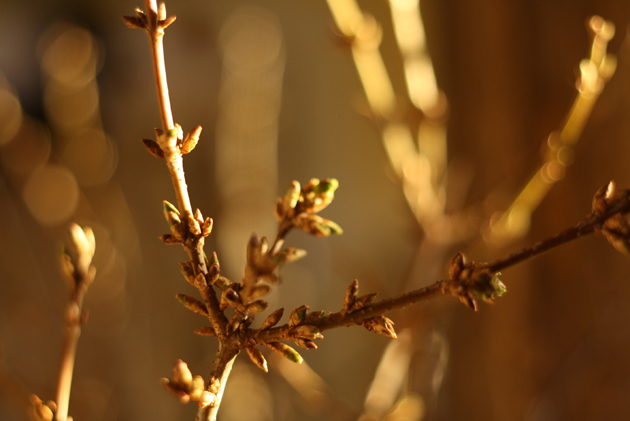 Make sure that you can actually see some buds that have already formed on the branches. 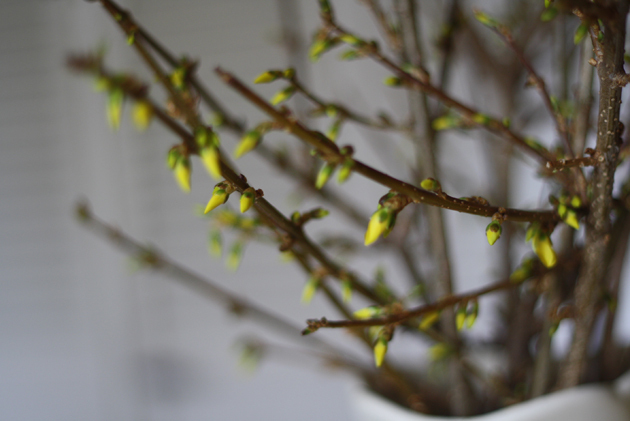 Forsythia is some of the first budding-blooming-bushes of Spring, exactly when will vary depending on where you live. Then, pull on some rubber boots and tromp through the soggy ground with some cutting shears and cut a few branches that you find to be breathtakingly beautiful. 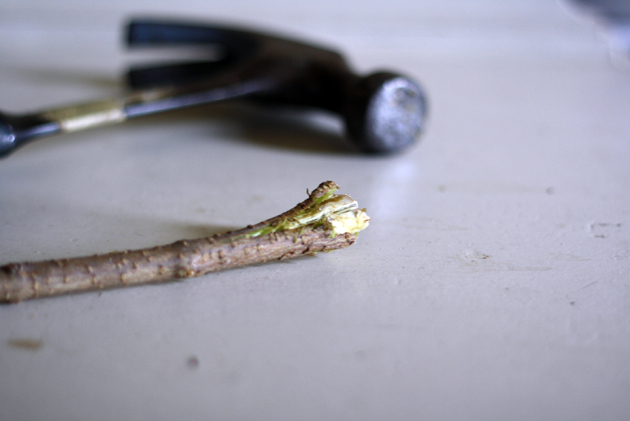 Before you place the beautiful branches into a sturdy vase (that won’t topple over once it’s full of branches), you’ll need to gently tap, tap, tap the woody ends with a hammer. This will allow the branches to more easily drink up the water. Remember to use warm water. This will also make it easier for the forsythia to drink. 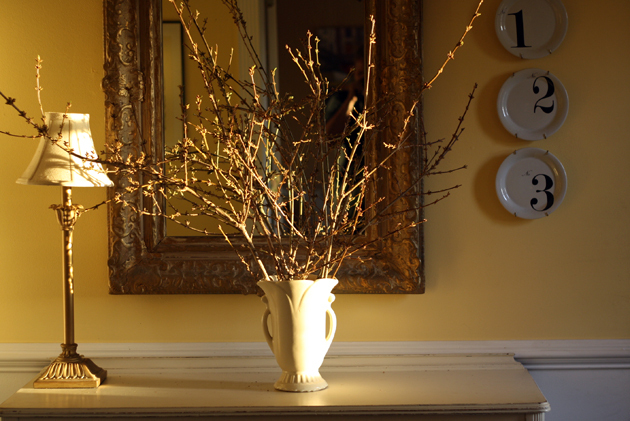 Next you’ll want to find a warm sunny spot for your forsythia to bask in the golden sunshine. This will encourage the branches to believe that it is indeed time to bloom. My warm sunny spot happens to be my foyer. 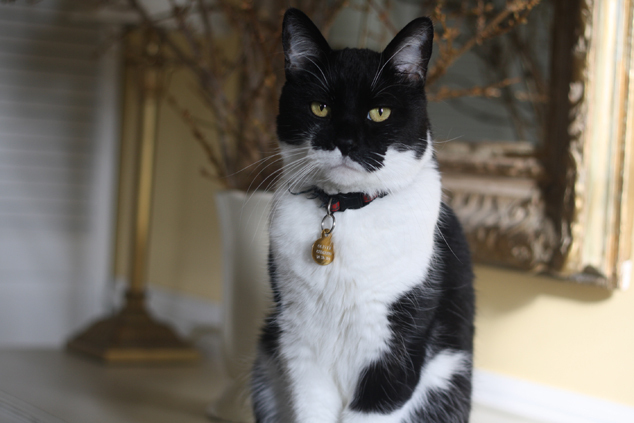 And as you can tell, this charming chap is thrilled to pieces to share his favorite spot with a vase full of forsythia. This is Oliver. 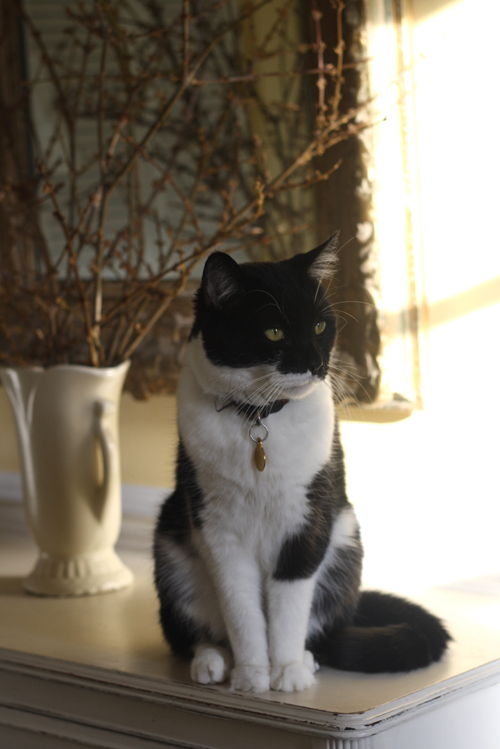 And Oliver loves nothing more than the warm golden sunshine that spills into the foyer as he lounges upon the buffet table. Sharing it with the forsythia. Not so much. Or maybe Oliver will just go away. Anyway. 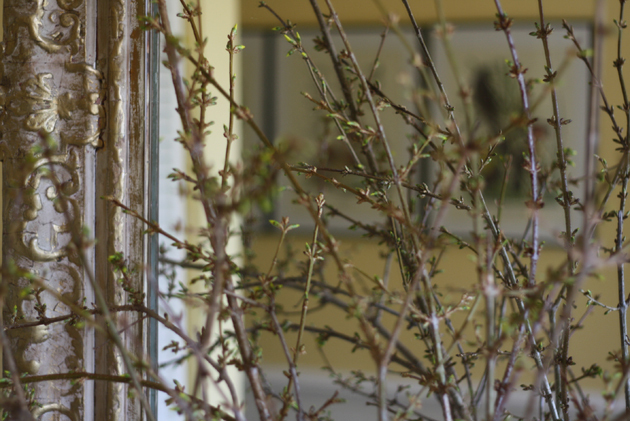 Back to my forcing of forsythia. After about a week or so, you’ll begin to see some sweet green peeking out from within the buds. Then, before you know it, all of the branches will soon be covered in the gorgeous green. A day or so later, some lovely yellow will appear. You’ll have a foyer full. 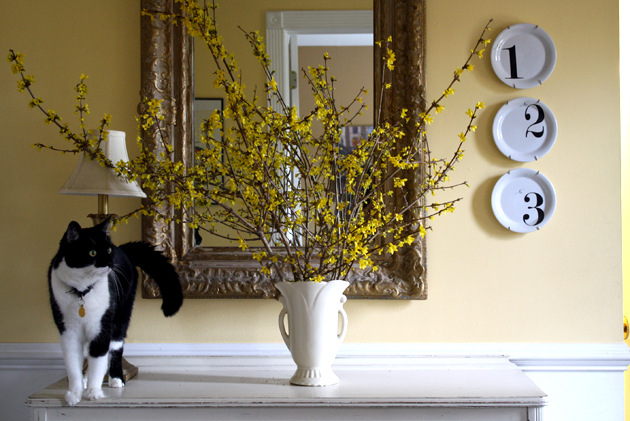 And that my friends is how you can get a fabulous fan of forsythia in your foyer with or without a finicky feline who is far from farklempt over the fact that he has to share his favorite spot. Lovely! I totally should’ve done this, but my forsythia beat me to the punch. It just bloomed. Will have to remember for next year. I have never done this, but have always wanted to. So lovely! 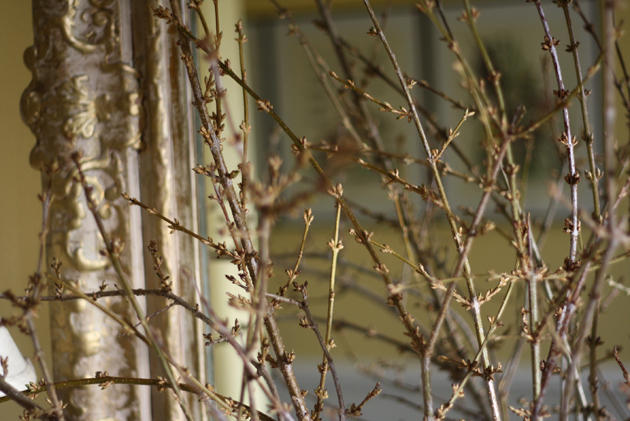 I love having Forsythia in house in early spring. They’re gorgeous, though I have a challenge my kitty likes to eat them. Beautiful photos and clever writing. We do this too! But yours is much much prettier. Beautiful! My favorite spring flower is ranunculus. I just got my first bouquet at the farmer’s market this week so I know spring is right around the corner! Good job with all the f words at the end. That is beautiful, I knew that could be done, but your step by step process with photos makes it look easy as pie. Now, if only the bunnies hadn’t eaten my Almond bush, I could do it too. 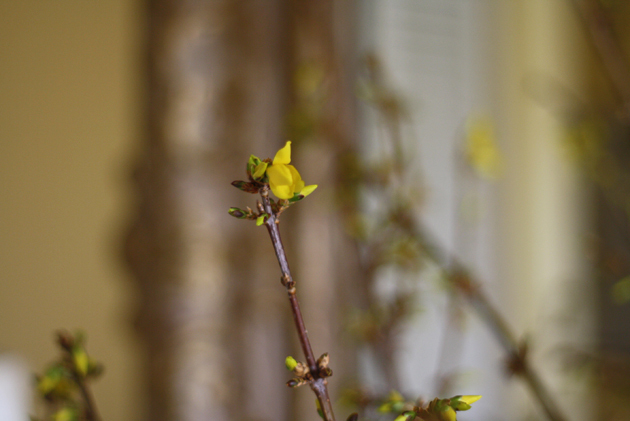 I LOVE forsythia…now why don’t I have any planted?!? And, oh, I LOVE Oliver! Just gorgeous! I am so ready for spring! 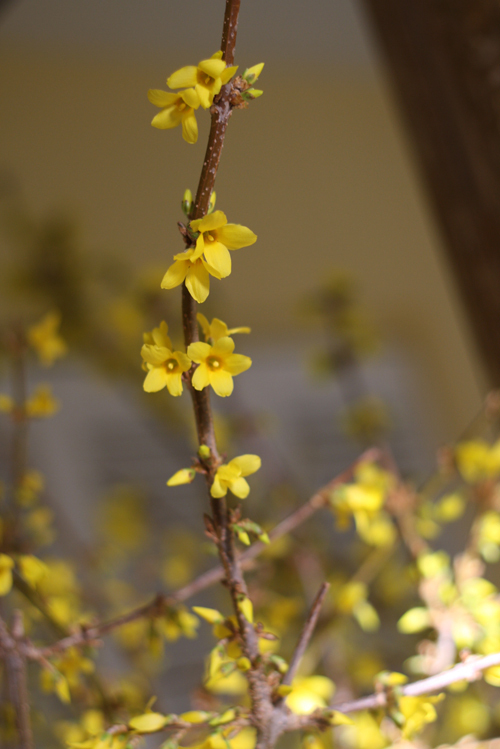 Forsythia is my favorite. I planted all along the edge of or property when we moved here, and a couple years ago my husband decided to “clean up” some brush and yanked it all out ; ( Wah pooey! Love the pictures and love the early Spring! Thanks for the tutorial~ I love flowers, but am so hopeless at actually, you know, growing them. I also love the amazing alliteration at the end of this post. Happy Spring!